Venom in snakes and some lizards is a form of saliva that has been modified into venom over its evolutionary history. In snakes, venom has evolved to kill or subdue prey, as well as to perform other diet-related functions. The evolution of venom is thought to be responsible for the enormous expansion of snakes across the globe. The evolutionary history of snake venom is a matter of debate. The common view of this history before 2014 was that venom originated just once among all Toxicofera approximately 170 million years ago, and then diversified into the wide range of venoms seen today. Under this hypothesis, the original toxicoferan venom was a very simple set of proteins that were assembled in a pair of glands. Subsequently, this set of proteins diversified in the various lineages of toxicoferans, including Serpentes, Anguimorpha, and Iguania. Several snake lineages subsequently lost the ability to produce venom, often due to a change in diet. The single-origin hypothesis suggests that the mechanism of evolution in most cases has been gene duplication followed by natural selection for adaptive traits. Some of the various adaptations produced by this process include venom more toxic to specific prey in several lineages, proteins that pre-digest prey, and a method to track down prey after a bite. These various adaptations of venom have also led to considerable debate about the definition of venom and venomous snakes. The idea that venom had a single evolutionary origin has been called into question by a 2015 study, which found that venom proteins had homologs in many other tissues in the Burmese python. The study therefore suggested that venom had evolved independently in a number of snake lineages. The origin of venom is thought to have provided the catalyst for the rapid diversification of snakes in the Cenozoic period, particularly to the Colubridae and their colonization of the Americas. Scholars suggest that the reason for this huge expansion was the shift from a mechanical to a biochemical method of subduing prey. Snake venoms attack biological pathways and processes that are also targeted by venoms of other taxa; for instance, calcium channel blockers have been found in snakes, spiders, and cone snails, thus suggesting that venom exhibits convergent evolution. Until the use of gene sequencing to create phylogenetic trees became practical, phylogenies were created on the basis of morphology. Such traditional phylogenies suggested that venom originated in multiple branches among Squamata approximately 100 million years ago. More recent studies using nuclear gene sequences found the presence of similar venom proteins in several lizards within a clade that was named "Toxicofera". This led to the theory that venom originated only once within the entire lineage approximately 170 million years ago. This ancestral venom consisted of a very simple set of proteins, assembled in a pair of glands. The venoms of the different lineages then diversified and evolved independently, along with their means of injecting venom into prey. This diversification included the independent evolution of front-fanged venom delivery from the ancestral rear-fanged venom delivery system. The single origin hypothesis also suggests that venom systems subsequently atrophied, or were completely lost, independently in a number of lineages. 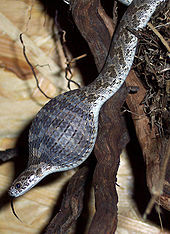 The American “rat snakes,” such as Pantherophis guttatus, lost their venom following the evolution of constriction as a means of prey capture. The independent evolution of constriction in the fish-eating aquatic genus Acrochordus also saw the degradation of the venom system. Two independent lineages, one terrestrial and one marine, that shifted to an egg-based diet, also possess the remnants of an atrophied venom system. The view that venom evolved just once has recently been called into doubt. A study performed in 2014 found that homologs of 16 venom proteins, which had been used to support the single origin hypothesis, were all expressed at high levels in a number of body tissues. The authors therefore suggested that previous research, which had found venom proteins to be conserved across the supposed Toxicoferan lineage, might have misinterpreted the presence of more generic "housekeeping" genes across this lineage, as a result of only sampling certain tissues within the reptiles' bodies. Therefore, the authors suggested that instead of evolving just once in an ancestral reptile, snake venom evolved independently in a number of lineages. A 2015 study found that homologs of the so-called "toxic" genes were present in numerous tissues of a non-venomous snake, the Burmese python. Castoe stated that the team had found homologs to the venom genes in many tissues outside the oral glands, where venom genes might be expected. This demonstrated the weaknesses of only analyzing transcriptomes (the total messenger RNA in a cell). The team suggested that pythons represented a period in snake evolution before major venom development. The researchers also found that the expansion of venom gene families occurred mostly in highly venomous caenophidian snakes (also referred to as "colubroidian snakes"), thus suggesting that most venom evolution took place after this lineage diverged from other snakes. Phospholipase A2, an enzyme found in normal tissue that has been adapted in certain snake venoms. The example pictured here is found in bee stings. The primary mechanism for the diversification of venom is thought to be the duplication of gene coding for other tissues, followed by their expression in the venom glands. The proteins then evolved into various venom proteins through natural selection. This process, known as the birth-and-death model, is responsible for several of the protein recruitment events in snake venom. These duplications occurred in a variety of tissue types with a number of ancestral functions. Notable examples include 3FTx, ancestrally a neurotransmitter found in the brain, which has adapted into a neurotoxin that binds and blocks acetylcholine receptors. Another example is phospholipase A2 (PLA2) type IIA, ancestrally involved with inflammatory processes in normal tissue, which has evolved into venom capable of triggering lipase activity and tissue destruction. The change in function of PLA2, in particular, has been well documented; there is evidence of several separate gene duplication events, often associated with the origin of new snake species. Non-allelic homologous recombination (or recombination between DNA sequences that are similar, but not alleles) has been proposed as the mechanism of duplication of PLA2 genes in rattlesnakes, as an explanation for its rapid evolution. These venom proteins have also occasionally been recruited back into tissue genes. Protein recruitment events have occurred at different points in the evolutionary history of snakes. For example, the 3FTX protein family is absent in the viperid lineage, suggesting that it was recruited into snake venom after the viperid snakes branched off from the remaining colubroidae. A cladogram adapted from Fry et al. (2012) showing a subset of suggested protein recruitment events, based on the "single-origin" or "toxicoferan" model of venom evolution. [A]: crotamine and cystatin. [B]: 12 toxin families, including CRiSPs and nerve growth factors. [C]: 2 toxin families, including PLA2 Type III. 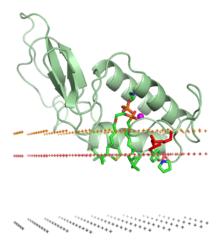 [D]: 13 toxin families, including 3FTx and metalloprotease. [E]: 2 toxin families, including PLA2 Type IIA. [F]: 2 toxin families, including PLA2 Type IB. [–]: loss of venom. There have been debates about whether the original gene duplication events occurred in a salivary gland or in body tissues themselves. The prevailing idea for many years is the birth-and-death model described above, in which genes in other body tissues are duplicated and then recruited to the venom gland before natural selection for toxicity. However, in 2014 a new model was proposed in which salivary protein genes are duplicated and then restricted to the venom gland. This model does away with the recruitment hypothesis and cites the homology between certain venom and body genes as unrelated in the linear fashion described in the traditional birth-and-death model. Gene duplication is not the only way that venom has become more diverse. There have been instances of new venom proteins generated by alternative splicing. The Elapid snake Bungarus fasciatus, for example, possesses a gene that is alternatively spliced to yield both a venom component and a physiological protein. Further diversification may have occurred by gene loss of specific venom components. For instance, the rattlesnake ancestor is believed to have had genes for neurotoxic PLA2 toxins, which are absent in modern non-neurotoxic Crotalus species. The various recruitment events had resulted in snake venom evolving into a very complex mixture of proteins. The venom of rattlesnakes, for example, includes nearly 40 different proteins from different protein families, and other snake venoms have been found to contain more than 100 distinct proteins. The composition of this mixture has been shown to vary geographically, and to be related to the prey species available in a certain region. Snake venom has generally evolved very quickly, with changes occurring faster in the venom than in the rest of the organism. Some traditional hypotheses of snake venom evolution have supported the idea that most snakes inject far more venom into their prey than is required to kill them; thus, venom composition would not be subject to natural selection. This is known as the "overkill" hypothesis. However, recent studies of the molecular history of snake venom have contradicted this, instead finding evidence of rapid adaptive evolution in many different clades, including the carpet vipers, Echis, the ground rattlesnakes, Sistrurus, and the Malayan pit viper, as well as generally in the diversification of PLA2 proteins. There is phylogenetic evidence of positive selection and rapid rates of gene gain and loss in venom genes of Sistrurus taxa feeding on different prey. Several studies have found evidence that venom and resistance to venom in prey species have evolved in a coevolutionary arms race. For example, wood rats of the genus Neotoma have a high degree of resistance to the venom of rattlesnakes, suggesting that the rats have evolved in response to the snake venom, thus renewing selection pressure upon the snakes. The selection pressure on snake venom is thought to be selecting for functional diversity within the proteins in venom, both within a given species, and across species. The genes that code for venom proteins in some snake genera have a proportion of synonymous mutations that is lower than would be expected if venom were evolving through neutral evolutionary processes. In addition, snake venom is metabolically costly for a snake to produce, which scientists have suggested as further evidence that a selection pressure exists on snake venom (in this case, to minimize the volume of venom required). The use of model organisms, rather than snakes' natural prey, to study prey toxicity, has been suggested as a reason why the "overkill" hypothesis may have been overemphasized. However, the pitviper genus Agkistrodon has been found to be an exception to this; the composition of venom in Agkistrodon has been found to be related to the position of the species within the phylogeny, suggesting that those venoms have evolved mostly through neutral processes (mutation and genetic drift), and that there may be significant variation in the selection pressure upon various snake venoms. The Mangrove snake Boiga dendrophila, whose venom is toxic to birds. Snakes use their venom to kill or subdue prey, as well as for other diet-related functions, such as digestion. Current scientific theory suggests that snake venom is not used for defense or for competition between members of the same species, unlike in other taxa. Thus adaptive evolution in snake venom has resulted in several adaptations with respect to these diet-related functions that increase the fitness of the snakes that carry them. Echis carinatus, one of the many species of the widespread genus Echis. The toxicity of Echis venom to scorpions has been found to vary with the proportion of arthropods in the snake's diet. Venom that is toxic only to a certain taxon, or strongly toxic only to a certain taxon, has been found in a number of snakes, suggesting that these venoms have evolved via natural selection to subdue preferred prey species. Examples of this phenomenon have been found in the Mangrove snake Boiga dendrophila, which has a venom specifically toxic to birds, as well as in the genera Echis and Sistrurus, and in sea snakes. However, while several snakes possess venom that is highly toxic to their preferred prey species, the reverse correlation is not necessarily true: the venoms of several snakes are toxic to taxa that they do not consume in high proportions. Most snake venom, for instance, is highly toxic to lizards, although the proportion of lizard prey varies among snake species. This has led researchers to suggest that toxicity to a certain taxon is nearly independent of toxicity to another distantly related taxon. The natural diets of snakes in the widespread viper genus Echis are highly varied, and include arthropods, such as scorpions, as well as vertebrates. Various Echis species consume different quantities of arthropods in their diet. A study carried out in 2009 injected scorpions with the venom of various Echis species, and found a high correlation between the proportion of arthropods that the snakes consumed in their natural habitat, and the toxicity of their venom to scorpions. The researchers also found evidence that the evolution of venom more toxic to arthropods was related to an increase in the proportion of arthropods in the snakes' diet, and that diet and venom may have evolved by a process of coevolution. A phylogeny of the genus constructed using mitochondrial DNA showed that one instance of a change in venom composition in the species ancestral to all Echis snakes was correlated with a shift to an arthropod based diet, whereas another shift in a more recent lineage was correlated with a shift to a diet of vertebrates. Despite the higher toxicity of the venom of arthropod-consuming species, it was not found to incapacitate or kill prey any faster than that of species with fewer arthropods in their diet. Thus, the venom is thought to have evolved to minimize the volume required, as the production of venom carries a significant metabolic cost, thus providing a fitness benefit. This pattern is also found in other lineages. Similar results were obtained by a 2012 study which found that the venom of arthropod-consuming Echis species was more toxic to locusts than that of vertebrate-consuming species. A 2009 study of the venom of four Sistrurus pit viper species found significant variation in the toxicity to mice. This variation was related to the proportion of small mammals in the diet of those species. The idea that Sistrurus venom had evolved to accommodate a mammal-based diet was supported by phylogenetic analysis. The researchers suggested that the basis for the difference in toxicity was the difference in muscle physiology in the various prey animals. Two lineages of elapid snakes, common sea snakes and Laticauda sea kraits, have independently colonized marine environments, and shifted to a very simple diet based on teleosts, or ray-finned fish. A 2005 study found that both these lineages have a much simpler set of venom proteins than their terrestrial relatives on the Australian continent, which have a more varied and complex diet. These findings were confirmed by a 2012 study, which compared the venoms of Toxicocalamus longissimus, a terrestrial species, and Hydrophis cyanocinctus, a marine species, both within the subfamily Hydrophiinae (which is also within the Elapid family). Despite being closely related to one another, the marine species had a significantly simpler set of venom proteins. The venoms of the sea snakes are nonetheless among the most toxic venoms known. It has been argued that since sea snakes are typically unable to prevent the escape of bitten prey, their venoms have evolved to act very rapidly. The various subspecies of the rattlesnake genus Crotalus, produce venoms that carry out two conflicting functions. The venom immobilizes prey after a bite, and also helps digestion by breaking down tissues before the snake eats its prey. As with other members of the family Viperidae, the venoms of Crotalus disrupt the homeostatic processes of prey animals. However, there is a wide variety of venom compositions among the species of Crotalus. A 2010 study found a 100-fold difference in the amount of metalloproteinase activity among the various snakes, with Crotalus cerberus having the highest activity and Crotalus oreganus concolor having the lowest. There was also a 15-fold variation in the amount of protease activity, with C. o. concolor and C. cerberus having the highest and lowest activities, respectively. Metalloproteinase activity causes hemorrhage and necrosis following a snake bite, a process which aids digestion. The activity of proteases, on the other hand, disrupts platelet and muscle function and damages cell membranes, and thus contributes to a quick death for the prey animal. The study found that the venoms of Crotalus fell into two categories; those that favored metalloproteinases (Type I) and those that favored proteases (Type II). The study stated that these functions were essentially mutually exclusive; venoms had been selected for based on either their toxicity or their tenderizing potential. The researchers also hypothesized that the reason for this dichotomy was that a venom high in neurotoxicity, such as a type II venom, kills an animal quickly, preventing the relatively slower acting metalloproteinase from digesting tissue. Another example of an adaptive function other than prey immobilization is the role of viperid venom in allowing the snake to track a prey animal it has bitten, a process known as "prey relocalization." This important adaptation allowed rattlesnakes to evolve the strike-and-release bite mechanism, which provided a huge benefit to snakes by minimizing contact with potentially dangerous prey animals. However, this adaptation then requires the snake to track down the bitten animal in order to eat it, in an environment full of other animals of the same species. A 2013 study found that western diamondback rattlesnakes (Crotalus atrox) responded more actively to mouse carcasses that had been injected with crude rattlesnake venom. When the various components of the venom were separated out, the snakes responded to mice injected with two kinds of disintegrins. The study concluded that these disintegrin proteins were responsible for allowing the snakes to track their prey, by changing the odor of the bitten animal. According to the hypothesis that snake venom had a single evolutionary origin, venom in a number of lineages of snakes subsequently atrophied. Evidence of such atrophication has been found in several snakes. A 2005 study in the marbled sea snake, Aipysurus eydouxii found that the gene for a three-fingered protein found in the venom had undergone a deletion of two nucleotide bases which made the venom 50-100 times less toxic than it had been previously. This change was correlated with a change in diet from fish to a diet consisting almost entirely of fish eggs, suggesting that the adaptation to an egg diet had removed the selection pressure needed to maintain a highly toxic venom, allowing the venom genes to accumulate deleterious mutations. A similar venom degradation following a shift to an egg-based diet has been found in the Common egg-eater Dasypeltis scabra, whose diet consists entirely of birds' eggs, meaning that the snake had no use for its venom. This has led biologists to suggest that if venom is not used by a species, it is rapidly lost. Venom atrophication has also occurred following the evolution of constriction as a method of prey capture that does not require venom. Constriction is hypothesized to have evolved independently in several lineages. North American ‘rat snakes’ such as the Corn snake Pantherophis guttatus use constriction to trap and kill their rodent prey, and do not possess functional venom. A similar process has occurred in the African colubrid lineage Lamprophiidae, such as Pseudaspis cana, as well as in the genus Acrochordus. ^ a b c Hargreaves et al. (a) 2014. ^ Casewell et al. 2013, pp. 218-220. ^ Fry et al. 2012, pp. 441-442. ^ a b Wuster et al. 2008. ^ Lomonte et al. (a) 2014, p. 326. ^ a b c d e f Fry et al. 2012, pp. 434-436. ^ Fry et al. 2012, pp. 424-436. ^ Casewell et al. 2013, pp. 224-227. ^ Casewell et al. 2013, pp. 222-223. ^ Barlow et al. 2009, pp. 2447-2448. ^ a b Calvete et al. 2012, pp. 4094-4098. ^ a b c d e f Li et al. 2005. ^ a b c d e Mackessy 2010. ^ a b c Saviola et al. 2013. ^ a b c d e Fry et al. 2012, p. 443. ^ a b c Reyes-Velasco et al. 2015. ^ a b Fry et al. 2012. ^ a b Lomonte et al. (a) 2014, pp. 326-327. ^ Mackessy 2010, p. 1464. ^ Casewell et al. 2013, pp. 225-227. ^ Fry & Wuster 2004, p. 870. ^ a b Hargreaves et al. (b) 2014, pp. 153-155. ^ Casewell et al. 2013, p. 223. ^ a b Lynch 2007. ^ a b Dowell et al. 2016. ^ a b Casewell et al. 2013, p. 223-224. ^ Fry & Wuster 2004, p. 871. ^ Fry et al. 2012, p. 435. ^ a b c d e f g Gibbs & Mackessy 2009. ^ Lomonte et al. (a) 2014, p. 334. ^ a b c d Barlow et al. 2009, p. 2443. ^ a b Barlow et al. 2009, p. 2447. ^ Casewell et al. 2013, p. 220. ^ Gibbs & Rossiter 2008. ^ Sanz et al. 2006, pp. 2098-2099. ^ a b Casewell et al. 2013, pp. 220-221. ^ Lomonte et al. (b) 2014, pp. 112-114. ^ Casewell et al. 2013, pp. 219-220. ^ Barlow et al. 2009, pp. 2444, 2447. ^ a b Barlow et al. 2009, pp. 2446-2448. ^ Casewell et al. 2013, pp. 223-225. ^ Richards et al. 2012. ^ Calvete et al. 2012, pp. 4092-4093. ^ Calvete et al. 2012, pp. 4097-4098. ^ Fry, Bryan G.; Scheib, Holger; Van Der Weerd, Louise; Young, Bruce; McNaughtan, Judith; Ramjan, S. F. Ryan; Vidal, Nicolas; Poelmann, Robert E.; Norman, Janette A. (2008). "Evolution of an Arsenal". Molecular & Cellular Proteomics. 7 (2): 215–246. doi:10.1074/mcp.M700094-MCP200. PMID 17855442. Barlow, A.; Pook, C.E. ; Harrison, R.A.; Wuster, E.W. (2009). "Coevolution of diet and prey-specific venom activity supports the role of selection in snake venom evolution". Proceedings of the Royal Society B: Biological Sciences. 276 (1666): 2443–2449. doi:10.1098/rspb.2009.0048. PMC 2690460. PMID 19364745. Calvete, J.J.; Ghezellou, P.; Paiva, O.; Matainaho, T.; Ghassempour, A.; Goudarzi, H.; Kraus, F.; Sanz, L.; Williams, D.J. (2012). "Snake venomics of two poorly known Hydrophiinae: Comparative proteomics of the venoms of terrestrial Toxicocalamus longissimus and marine Hydrophis cyanocinctus". Journal of Proteomics. 75 (13): 4091–4101. doi:10.1016/j.jprot.2012.05.026. PMID 22643073. Casewell, N.R. ; Wuster, W.; Vonk, F.J.; Harrison, R.A.; Fry, B.G. (2013). "Complex cocktails: the evolutionary novelty of venoms". Trends in Ecology & Evolution. 28 (4): 219–229. doi:10.1016/j.tree.2012.10.020. PMID 23219381. Dowell, Noah L.; Giorgianni, Matt W.; Kassner, Victoria A.; Selegue, Jane E.; Sanchez, Elda E.; Carroll, Sean B. (2016). "The Deep Origin and Recent Loss of Venom Toxin Genes in Rattlesnakes". Current Biology. 26 (18): 2434–2445. doi:10.1016/j.cub.2016.07.038. PMC 5207034. PMID 27641771. Gibbs, H. Lisle; Rossiter, Wayne (6 February 2008). "Rapid Evolution by Positive Selection and Gene Gain and Loss: PLA2 Venom Genes in Closely Related Sistrurus Rattlesnakes with Divergent Diets". Journal of Molecular Evolution. 66 (2): 151–166. doi:10.1007/s00239-008-9067-7. ISSN 0022-2844. PMID 18253686. Fry, B.G. ; Casewell, N.R. ; Wuster, W.; Vidal, N.; Young, B.; Jackson, T. N. W. (2012). "The structural and functional diversification of the Toxicofera reptile venom system". Toxicon. 60 (4): 434–448. doi:10.1016/j.toxicon.2012.02.013. PMID 22446061. Fry, Bryan G. (1 March 2005). "From genome to "venome": Molecular origin and evolution of the snake venom proteome inferred from phylogenetic analysis of toxin sequences and related body proteins". Genome Research. 15 (3): 403–420. doi:10.1101/gr.3228405. ISSN 1088-9051. PMC 551567. PMID 15741511. Fry, Bryan G.; Wuster, Wolfgang (2004). "Assembling an Arsenal: Origin and Evolution of the Snake Venom Proteome Inferred from Phylogenetic Analysis of Toxin Sequences". Molecular Biology and Evolution. 5 (21): 870–883. doi:10.1093/molbev/msh091. PMID 15014162. Gibbs, H.L. ; Mackessy, S.P. (2009). "Functional basis of a molecular adaptation: Prey-specific toxic effects of venom from Sistrurus rattlesnakes". Toxicon. 53 (6): 672–679. doi:10.1016/j.toxicon.2009.01.034. PMID 19673082. Hargreaves, Adam D.; Swain, Martin T.; Hegarty, Matthew J.; Logan, Darren W.; Mulley, John F. (1 August 2014). "Restriction and Recruitment—Gene Duplication and the Origin and Evolution of Snake Venom Toxins". Genome Biology and Evolution. 6 (8): 2088–2095. doi:10.1093/gbe/evu166. ISSN 1759-6653. PMC 4231632. PMID 25079342. Hargreaves, Adam D.; Swain, Martin T.; Logan, Darren W.; Mulley, John F. (2014). "Testing the Toxicofera: Comparative transcriptomics casts doubt on the single, early evolution of the reptile venom system". Toxicon. 92: 140–156. doi:10.1016/j.toxicon.2014.10.004. PMID 25449103. Li, M.; Fry, B.G. ; Kini, R.M. (2005). "Eggs-only diet: Its implications for the toxin profile changes and ecology of the marbled sea snake (Aipysurus eydouxii)" (PDF). Journal of Molecular Evolution. 60 (1): 81–89. doi:10.1007/s00239-004-0138-0. PMID 15696370. Lomonte, B.; Fernandez, J.; Sanz, L.; Angulo, Y.; Sasa, M.; Gutierrez, J. M.; Calvete, J. J. (2014). "Venomous snakes of Costa Rica: Biological and medical implications of their venom proteomic profiles analyzed through the strategy of snake venomics". Journal of Proteomics. 105: 323–339. doi:10.1016/j.jprot.2014.02.020. PMID 24576642. Lomonte, B.; Tsai, W. C.; Urena-Diaz, J. M.; Sanz, L.; Mora-Obando, D.; Sanchez, E. E.; Fry, B.G. ; Gutierrez, J. M.; Gibbs, H. L.; Sovic, M.G. ; Calvete, J.J. (2014). "Venomics of New World pit vipers: Genus-wide comparisons of venom proteomes across Agkistrodon". Journal of Proteomics. 96: 103–116. doi:10.1016/j.jprot.2013.10.036. PMC 4294458. PMID 24211403. Lynch, V.J. (2007). "Inventing an arsenal: adaptive evolution and neofunctionalization of snake venom phospholipase A(2) genes". BMC Evolutionary Biology. 7 (1): 2. doi:10.1186/1471-2148-7-2. PMC 1783844. PMID 17233905. Mackessy, Stephen P. (2010). "Evolutionary trends in venom composition in the Western Rattlesnakes (Crotalus viridis sensu lato): Toxicity vs. tenderizers". Toxicon. 55 (8): 1463–1474. doi:10.1016/j.toxicon.2010.02.028. PMID 20227433. Reyes-Velasco, Jacobo; Card, Daren C.; Andrew, Audra L.; Shaney, Kyle J.; Adams, Richard H.; Schield, Drew R.; Casewell, Nicholas R.; Mackessy, Stephen P.; Castoe, Todd A. (1 January 2015). "Expression of Venom Gene Homologs in Diverse Python Tissues Suggests a New Model for the Evolution of Snake Venom". Molecular Biology and Evolution. 32 (1): 173–183. doi:10.1093/molbev/msu294. ISSN 0737-4038. PMID 25338510. Richards, D. P.; Barlow, A.; Wüster, W. (1 January 2012). "Venom lethality and diet: Differential responses of natural prey and model organisms to the venom of the saw-scaled vipers (Echis)". Toxicon. 59 (1): 110–116. doi:10.1016/j.toxicon.2011.10.015. PMID 22079297. Sanz, Libia; Gibbs, H. Lisle; Mackessy, Stephen P.; Calvete, Juan J. (2006). "Venom Proteomes of Closely Related Sistrurus rattlesnakes with Divergent Diets". Journal of Proteome Research. 5 (9): 2098–2112. CiteSeerX 10.1.1.506.9290. doi:10.1021/pr0602500. PMID 16944921. Saviola, A.J. ; Chiszar, D.; Busch, C.; Mackessy, S.P. (2013). "Molecular basis for prey relocation in viperid snakes". BMC Biology. 11 (1): 20. doi:10.1186/1741-7007-11-20. PMC 3635877. PMID 23452837. Wuster, Wolfgang; Peppin, Lindsay; Pook, Catherine E.; Walker, Daniel E. (2008). "A nesting of vipers: Phylogeny and historical biogeography of the Viperidae (Squamata: Serpentes)". Molecular Phylogenetics and Evolution. 49 (2): 445–459. doi:10.1016/j.ympev.2008.08.019. PMID 18804544. This page was last edited on 13 February 2019, at 14:19 (UTC).